This fascinating hand colored 1815 map by Edinburgh cartographer John Thomson depicts Prussia (central and northern Europe). 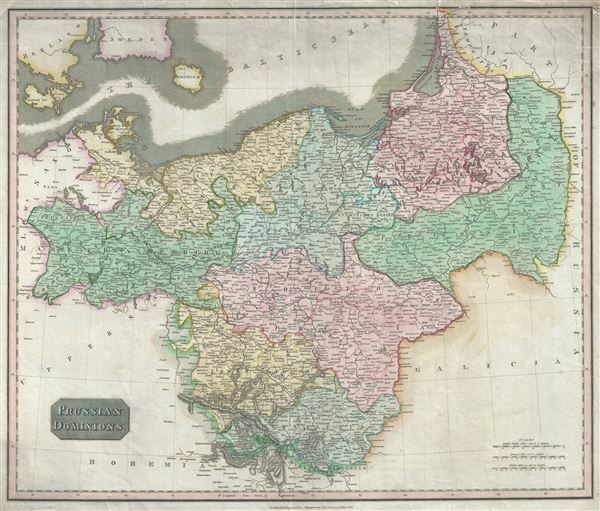 The Map covers from the Baltic Sea to Upper Silesia and from Lower Saxony to Russia, including parts of modern day Poland. In 1815 Prussia emerged from the Napoleonic Wars and the Congress of Vienna as the dominant Germanic power. Its new borders included much of the Kingdom of Saxony, Rhineland, and Poland. In subsequent years Prussia would take a leading role in governing the German Confederation. The German Confederation, created in 1814, acted as a buffer zone between Austria and Prussia, its two largest and most powerful member states. Nonetheless the rivalry between the two powerful states would increase until the break out of the Austro-Prussian War in 1866. Prussia would win the Austro-Prussian War, which would ultimately lead to the collapse of the German Confederation. A few years later, in 1871, most of the former Confederation states were folded into the newly proclaimed German Empire. The whole is beautifully engraved in the minimalist English style pioneered in the early part of the 19th century. Thomson maps are known for their stunning color, awe inspiring size, and magnificent detail. Thomson's work, including this map, represents some of the finest cartographic art of the 19th century. Relief is shown by hachure with towns, cities, and major topographical features identified. Engraved in 1815 and issued as plate no. 31 in the 1815 edition of Edinburgh cartographer John Thomson's New General Atlas. Very good. Minor wear and verso repair along original centerfold. Margins and borders exhibit some damage with verso reinforcement. Rumsey 1007.032 (1817 edition). Phillips (Atlases) 731. Newberry Library: Ayer 135 T4 1817.